Let’s be clear from the start – Hip Hop and Rap are not my thing. And while we can go into a long involved conversation about why that is, this is neither the time nor place. Suffice it to say that, with a few rare and I will admit archaic exceptions, it has never appealed to me, no matter how many times I have read the very interesting blog of my good friend Lamont Swittenberg, who is clearly something of an expert in the field (check him out at: http://lamontslist.blogspot.com/). I just can’t, as it were, get over the hump. I do, however, find several of the more famous artists quite compelling and not the least among these is Jay-Z. There’s his modern rags-to-riches story, which is such a central part of the classic American narrative; there’s his complex existence as a black man in the highest echelons of the overwhelmingly white corporate world; there is his obviously sophisticated understanding his brand, of its power and of its pitfalls; there’s his unique position within the African-American community. The list goes on and on. 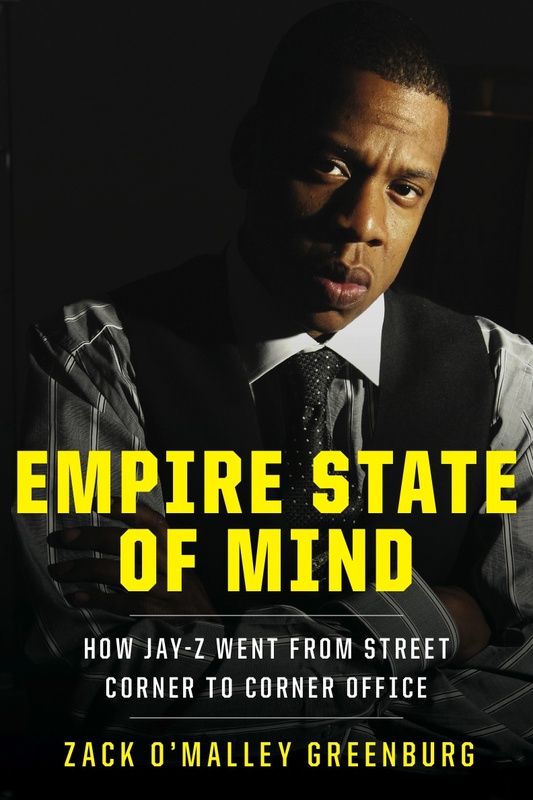 And while there’s a lot that author Zack O’Malley Greenburg explains to me in his book – Empire State of Mind – that I didn’t know, I fear I have to chalk that up more to my ignorance of Jay-Z than to any particular insight or depth of reporting by Mr. Greenburg. Now, admittedly, Jay-Z is an exceptionally difficult man to write about. There are, for example, a lot of myths surrounding him. Like the ones about what exactly he did in Trenton and how deeply involved in the drug world he was. And sorting it out is a messy business, one that involves the kind of he said/she said interviews that are anything but conclusive. And that leads to the second thing about Jay-Z that makes writing about him so difficult – he’s extremely polarizing. People don’t just dislike or disagree with him, they hate him or worship him. They think he’s the devil incarnate, a backstabbing fraud, a drug-dealer who sells out his friends. Or they love him, think he’s a benevolent genius, beset by petty hacks, has-beens and never-wases that couldn’t keep up with someone of his talent, vision and scope. There is no middle ground. Which puts Mr. Greenburg in the unenviable position of having to referee just about every fact of his subject’s life. And since he has no more inside information than we do, he more or less abstains. And that leads to the third challenge when writing about the former Mr. Shawn Carter – Jay-Z has about as tight a control over his public image as anyone I’ve ever read about. As a result, this unauthorized biography by Greenburg – a staff writer at Forbes who has profiled Akon, 50 Cent and Afrika Bambaataa – is missing the most important voice of all, that of Jay-Z himself. Thus Greenburg is forced to interview around the edges, resulting in a book that seems to fall through the cracks. I doubt there is much new here that fans of Jay-Z don’t already know, relegating the audience to readers like me, the unconverted who are simply curious to learn more about an important public figure. A slim readership, to be sure. Which probably begs the question – what relevance does any of this have to the advertising community at large. A couple, I think. First, advertising is about where culture and commerce intersect, and it is undeniable that Jay-Z is an integral part of contemporary culture. Learning more about him – and discussing the merits of one of the few biographies of him – helps us decode that culture. Secondly, there’s a lot that managers can learn from Jay-Z about brand management. About how every part of your brand is something that can either build it or break it; about how to extend your brand as Jay-Z did to everything from clothing to champagne, and how to stop extending when you realize you’re making a mistake (as he did in his deal with Jeep); and probably most importantly, about how to make sure you have a tight hand on the parts of it that you can control – since so much is out of your control anyway. And lastly? That business is business – and the successful are those who rest with one eye up, regardless of the industry, era or audience. Empire State of Mind by Zack O’Malley Greenburg was published by Portfolio/Penguin on 3/17/11 – order it from Amazon here or from Barnes & Noble here – or pick it up at your local bookseller ( find one here).